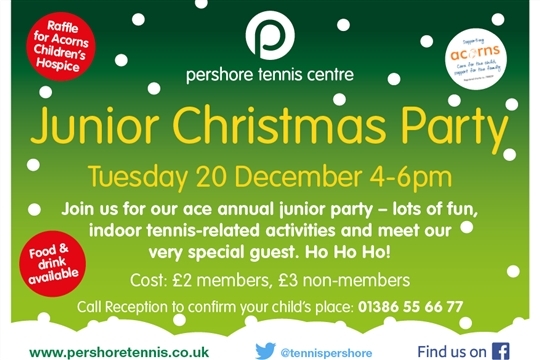 PERSHORE TENNIS CENTRE HOSTS THEIR ACE ANNUAL JUNIOR CHRISTMAS PARTY FROM 5PM-8PM ON TUESDAY 20 DECEMBER 2016. PLEASE COME AND JOIN US AND JOIN IN FOR A SMASHING TIME ON COURT AND THE CHANCE TO MEET OUR VERY SPECIAL GUEST! HO HO HO!